Back row: Mary Sullivan, Joyce Graham, Olive Dunn, Marge Johnson, Enid Johnson. Front row: May Peacock (behind extinguishers), Lorraine Davies, Elma Paul, Jean Weeks, Alma Collet, Marion Oxley, Joy White, Betty Morrow (behind steering wheel), Audrey Cameron, Miss Aberdeen, Elaine Bertram, Shirley Armstrong. What is the Women’s Fire Auxiliary? The WFA was a section of the Women’s Australian National Service (WANS). The Wagga Wagga WANS Branch became the third unit outside the metropolitan area to form a WFA; the other two being Lithgow and Wollongong. The value of auxiliary fire fighters had been proved where air raids had ravaged overseas countries and the Wagga Wagga WFA spent three months doing their course of fire fighting. This course included weekly lectures delivered by Sub-Station Officer Paske, assisted by Senior Fireman McHendry. Sub-station Officer Pettit gave lectures in the absence of Mr Paske when he was annual leave. As well as lectures, an essential part of the course was spent on practical work with hoses, chemical extinguishers and a regular feature was the use of the latest fire fighting appliances. 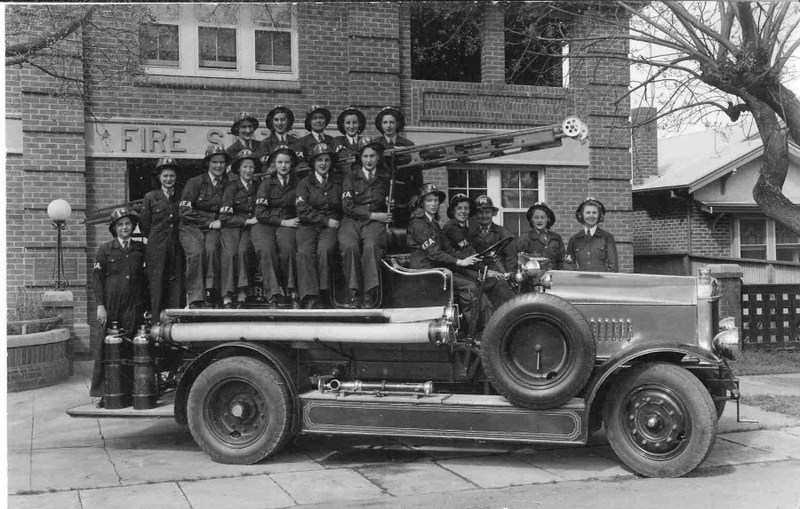 To become familiar with the routine of the fire station the girls were posted to watch room duty at the Wagga Wagga Fire Station and by July 1942 they were ready for the examinations. These were held at the Fire Station where the Inspector of NSW Fire Brigades, J Neville, was in charge and said that the girls were well up to the standard of the syllabus, which was essentially based on fire prevention, fire extinguishing and fire protection. The first successful WFA candidates to pass the examinations were: Misses A Aberdeen, E Paull, J Wickes, R Fitzgerald, E Woodland, A Pellans; B Harrington, M Sullivan, B Morrow, J Fenton, O Dunn, D Crowe and E Collett. In addition to their fire fighting training, the WFA were expected to attend drill practice at the drill hall with the WANS as well as first aid classes, lectures and demonstrations provided by the Air Raid Precaution and were rostered for canteen duty at the services rest hut. WFA girls were equipped with two uniforms, their working gear consisted of navy blue combination overalls with a scarlet WFA armband; their dress uniform was a grey two piece suit, white shirt, tie and the scarlet armband. At a WANS display on December 15, 1942, the WFA, under the command of their captain Miss Audrey Cameron, gave a display of rescue drill by demonstrating the strenuous task of dragging a heavy person from a burning building, followed by gas mask drill showing protection from any poison gases that could be encountered. The WFA concluded their demonstrations with a wet drill – the hoses and hydrant were connected and, using a length of 100ft hose, water was sprayed over the ground in record time. In an interview, Mr Paske explained that at a fire demonstration in Sydney a 25ft hose was used by WFA and considered to be satisfactory whereas the Wagga girls capably managed to handle the 100ft hose and that he was particularly pleased with their work. Ten members of the WFA went to Sydney to take part in a Fire Brigade’s field day held at Centennial Park in April 1944; although the Wagga unit was not successful, they learnt new procedures and it was reported in The Daily Advertiser that they enjoyed the experience immensely. From the Sydney demonstrations, an image of May Peacock, Emma Collett and Betty Morrow jumping from a fire unit at the Fire Brigade’s field day was printed in The Daily Advertiser on April 29, 1944. At the end of the war, the WFA was disbanded and women were excluded from paid fire fighting service; this was made official by government legislation. 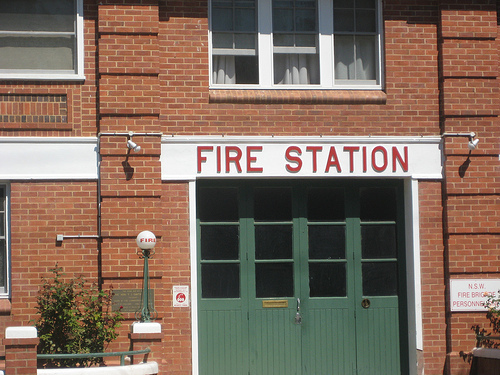 It was not until 1978 that it was announced that women, for the first time, would be “allowed” to join the NSW Fire Brigade as active fire fighters; this announcement coincided with the news that a site for a second fire station was being considered in Wagga Wagga. References: CSU Regional Archives RW2008; The Daily Advertiser: 07/07/1942, 15/07/1942, 17/12/1942, 22/04/1944, 29/04/1944, 18/09/1944. State Records holds two series of records from the Board of Fire Commissioners relating to the Women’s Fire Auxiliary. 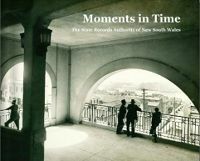 One is NRS 559 Women’s Fire Auxiliary Press cuttings book, Jan 1940-Jul 1947 http://investigator.records.nsw.gov.au/Entity.aspx?Path=\Series\559 and the other is NRS 516 Women’s Fire Auxiliary – leave of absence applications, 1942-1944 http://investigator.records.nsw.gov.au/Entity.aspx?Path=\Series\516. The latter series relates to three Sydney stations. There is also some information on the Women’s Auxiliary Fire Brigade Corps in Colin Adrian, Fighting Fire! A century of service, 1884-1984. Sydney, Allen & Unwin, 1984. It notes (p.148) that there were 3000 WFA members!